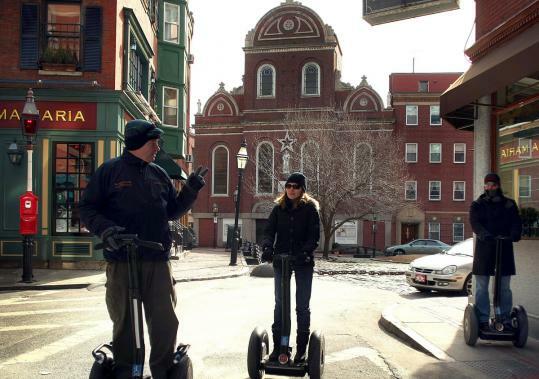 The Boston City Council has good reason to limit where Segway tours can operate downtown. Elderly grandmothers and moms with strollers shouldn’t have to dodge the speedy two-wheelers on North End sidewalks. But regulations passed by the council last week will prohibit all Segway tours from operating on public walkways, which means the tours will be forced to share the streets with automobiles and bicycles. That’s a recipe for disaster. Segway tumbles happen, especially among those riding the upright machines for the first time. The last thing Boston needs is wide-eyed tourists belly-flopping into oncoming traffic. Instead of crafting a compromise between Segway-haters and Boston Glides, the city’s sole Segway tour operator, East Boston City Councilor Sal LaMattina seems dead set on squeezing Segways out of Boston entirely. It would be a shame if he succeeds. They may lack the charm of walking tours, but Segway rides are an enjoyable way to experience Boston’s historic sites, especially for people who aren’t very mobile. There’s a logical middle ground between letting Segways run amok and banishing them altogether: The city should approve a limited number of routes on wide-enough sidewalks, or on paths that tend to be less trafficked during the day. Mayor Menino shouldn’t sign the ordinance until that change has been made. A re-tooled bill should also grant operators a reasonable time period to comply with the new regulations. The popular tours are already filling up for the summer, and the company that offers them shouldn’t be compelled to close down during the height of tourist season, especially considering that there have been no collisions involving pedestrians since the tours began three years ago. The city should be able to promote pedestrian safety without harming a local business, or throwing Segway riders — almost literally — under the bus.